ASCCC Formally Launching OER Initiative! The ASCCC OER Task Force would appreciate if you would spent 10-15 minutes of your time completing this survey designed to inform our work. NameCoach is excited to announce their partnership with the Foundation for the California Community College System and the Online Education Initiative! NameCoach is a new tool provided by the OEI to California Community Colleges that nurtures inclusion campus-wide. It is now available to all OEI consortiums colleges at no cost and available to all CCCs at a discount. Please join NameCoach’s CEO Praveen Shanbhag to learn about how NameCoach helps build a more inclusive and equitable classroom. NameCoach provides students with a simple way to record a pronunciation of their name and convey their gender that is easily shared with their instructor and student peers. In this webinar, you will see NameCoach in action and hear how Foothill College has used it in Canvas and for commencement to foster belonging and address equity gaps. NameCoach can be used in conjunction with a variety of campus technologies to provide on-demand playback of student name pronunciations wherever they may be needed. The core features of NameCoach solve many of the challenges universities face with building inclusive campus communities. More Helpful Webinars from the OEI! The California Virtual Campus – Online Education Initiative invites you and members of your College Implementation Team to attend an upcoming Notebowl Implementation Webinar to introduce the service, explain the benefits for student success, and review the implementation process for your college, and provide an important service to your students with the support of the CVC-OEI. All are welcome! The webinar will be held on Wednesday, November 7 from 1:00PM – 2:00PM. The webinar will be recorded and sent to participants with captions after the live session. For real-time captioning services, please contact Karen Oeh (koeh@ccconlineed.org) at least 7 business days prior to the meeting. If you have any questions, please feel free to contact me at koeh@ccconlineed.org. And while you are visiting, take a look at the feature documentary done by the Director of the Digital Design Studio, Scott Kecken. We Are Arabbers follows the horse-and-wagon produce vendors along the streets of Baltimore, Maryland as they struggle to make a living and maintain their unique culture. I’ve been attending these every Friday and learning something new each time. If you or someone you know are interested in Open Educational Resources these webinars from the Academic Senate for California Community Colleges are an excellent place to start. In preparation for launching its own statewide OER initiative, the ASCCC is hosting weekly OER webinars on Fridays at 9:30am. Each of November’s webinars will focus on the available OER resources for a specific discipline, with faculty sharing their OER-adoption experience. Each webinar is designed to provide information, share resources, and hear from you. All will be recorded for later viewing or use and posted on the ASCCC website. Please forward this message on to all interested parties. During the 2011 Convention of the Association for Educational Communications and Technology, Dr. Michael Simonson was interviewed by Cynthia Burfield about current trends and future issues in the field of instructional technology and distance education. Simonson on Trends in Instructional Technology and Distance Education from Michael Simonson on Vimeo. 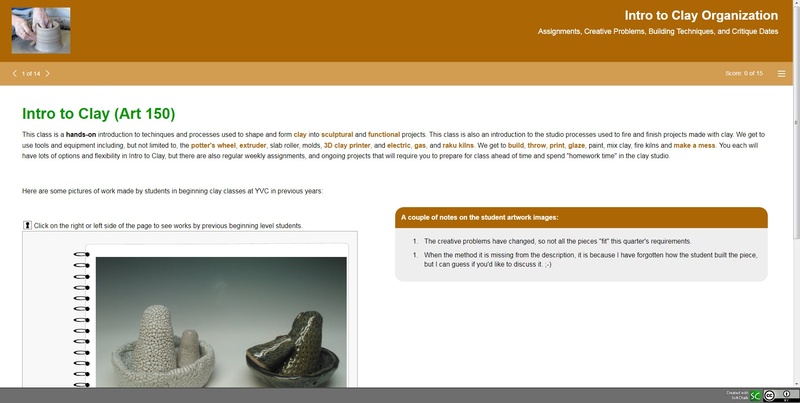 Embed Free OER Interactive Lessons in your courses from Softchalk Cloud! We’re here to highlight the wonderful work educators, like you, are doing at your institution. Each week we select a standout, top notch, lessons from SoftChalk Share and feature it across our social media platforms. 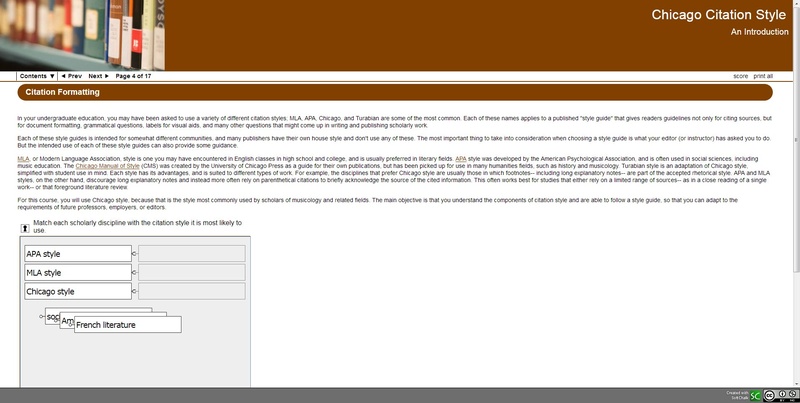 The objectives of this lesson are to be able to distinguish between the various citation styles, format Chicago-style bibliography citations and to format Chicago-style footnotes. 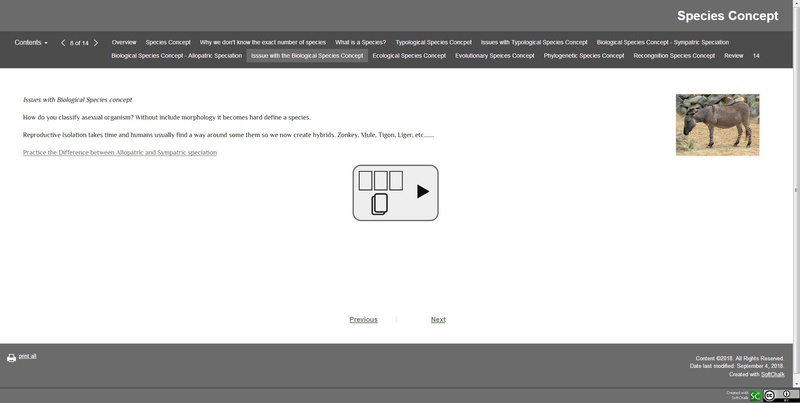 In this lesson, students learn about different species concepts including ecological, evolutionary and phylogenetic. They also learn about the issues with the various concepts and why we don’t know the exact number of species. 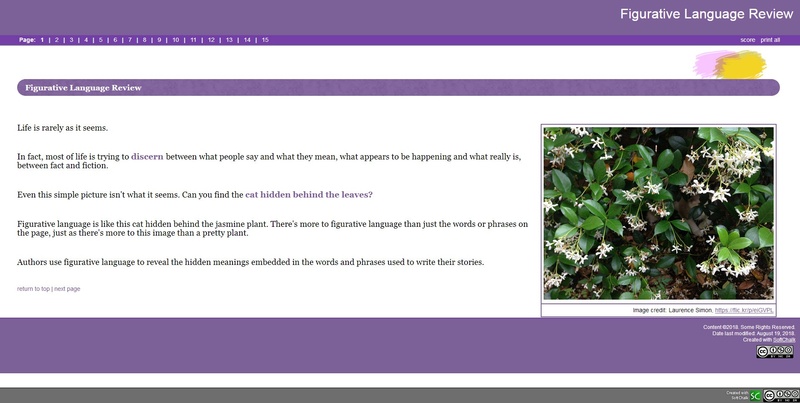 This lesson discusses how authors use figurative language to reveal the hidden meanings embedded in the words and phrases used to write their stories. Students learn to define and identify examples of similes, metaphors, personification, imagery, and symbolism. This lesson serves as an overview of the organization for an ART 150 class, including individual and planning assignments, project requirements and due dates, creative problems, and project ideas.